We’ve all got that essential tool in our make-up bag, the one that goes with us everywhere, the one thing we couldn’t live without on a desert island! It could be a basic essential such as tweezers (to deal with al those nasty palm-tree splinters) or something completely vain like an eyebrow brush (you never know how gorgeous the natives will be). 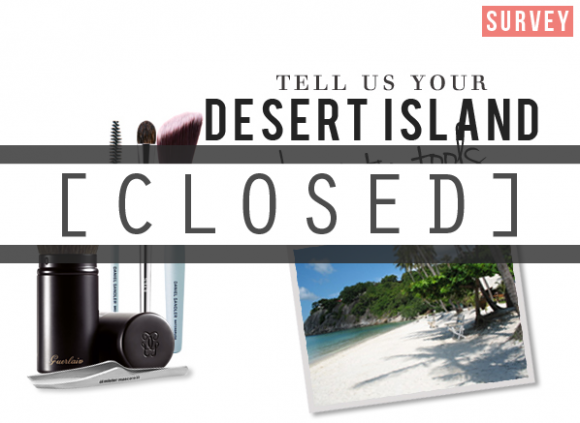 We’d love to know your desert island beauty tools. And in return we’ll give one lucky responder a £20 voucher to spend at Escentual. Only one entry per person (based on IP address) will be counted. Automated entries will be disqualified from the prize draw. Entries will close at 9am on the Monday 13th August, and prize winners will be notified the following day. One winner will be picked at random. Escentual reserves the right to withdraw any nominations or votes if they feel they are abusing the competition or any of its rules. General Terms & Conditions apply. This entry was posted on Monday, August 6th, 2012 at 9:10 am and is filed under Competitions, Survey. You can follow any responses to this entry through the RSS 2.0 feed. You can skip to the end and leave a response. Pinging is currently not allowed. I voted for tweezers, thanks! would have to be tweezers!!! feel disgusting if i cant keep my eyebrows nice!!! I voted for blusher brush as i think sweeping a bit of blush onto my cheeks really makes a difference and makes me look more youthful and healthy. I chose nail scissors as they come in handy in all sorts of emergencies. I voted nail file not only do I like my nails to look neat and tidy, if I have a ragged nail it drives me crazy!!! I voted for tweezers, as I cannot stand having a mono-brow! Besides, there may be a hot bloke there who I can impress! Nail scissors, as you can use them for so many things.